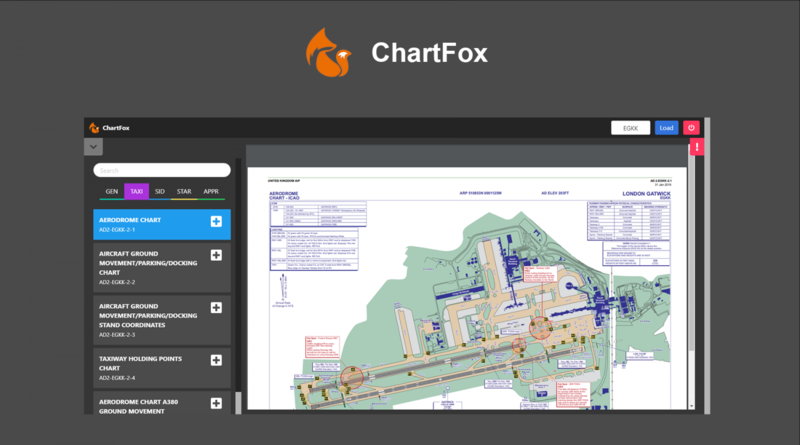 ChartFox is a completely free, digital chart solution for flight simulation purposes. For too long when flying on the network you have had to trawl through mis-matched AIPs, foreign languages and confusing websites to gain access to publicly available charts and airfield information. ChartFox attempts to solve these issues, by giving pilots quick and easy access to charts on-the-fly, across most devices. It currently has around 20,000 charts accessible spanning over 1,200 airports, with more countries being supported over time. On average, 80% of flights on the network have at least one fully supported airport in their flight plan (and more have the AIP supported in lieu)! A full coverage map and live stats can be found on the homepage. ChartFox has, for the past month or so, undergone a series of closed beta tests with members of VATSIM UK, and has also recently been implemented on VATSIM UK’s airfield information pages. Now, after a successful testing period, ChartFox is being rolled out for the whole of the VATSIM membership to enjoy! Congratulations to you and the ChartFox team! Is there anyway the South America Division can help you add charts for our region? - Fri Mar 15, 2019 7:06 am #531381 Looks Brilliant....congratulations and thank you to the team. - Fri Mar 15, 2019 9:14 am #531385 Great innovation! This should be included in the pilot clients, I fear there is not enough exposure on the forum. - Fri Mar 15, 2019 5:37 pm #531394 What are you using adsbygoogle for? Jeff Thomas 812289 wrote: What are you using adsbygoogle for? - Sat Mar 16, 2019 8:00 am #531412 Great work. - Sun Mar 17, 2019 12:40 pm #531439 Well done on the site, Chartfox.org!! I have been looking for something to help supplement/replace my usage of a few other charting sites and with the docking feature, Chartfox almost does this for me. So I will leave you some feedback that may assist. The one thing that makes me revert back to my old meathod of having each chart loaded onto a separate chrome tab to cycle to when needed is that while using Chartfox, each time I load a chart from the dock I have to resize and rotate. The need to resize and rotate the chart each time it is selected from the dock does not allow me to quickly cycle from one to the other and then back again in an efficient enough manner for my use. If you would happen to have the time and ability to add a feature where once a chart is loaded into the dock, resized and rotated that each time it is reloaded from the dock it brings the chart up in its previous state, I would probably start to use Chartfox as my primary means. Lastly request the ability to open a chart onto a full windowed tab as well. Most of the time having the chart with the remainder of the site surrounding it work sufficiently enough, but I do have a few that I use where I prefer the chart to be full window. The inability to do this on Chartfox is another small item that causes me revert back to other chart websites. Again well done, and thank you for the time and effort you have put into this site to help improve upon our hobby. I am excited to find more ways where I can implement my usage of Chartfox into my flying and controlling routines! Edit:Also FYI although the site states that it works with most phones and particularly mentions iOS , it did not work on my iPhone 7 Plus. It states that the site does not support the my small screen size. I do not foresee this as an issue as I would not typically be using my phone for charts, but it was just something I noticed that differed from the site information.